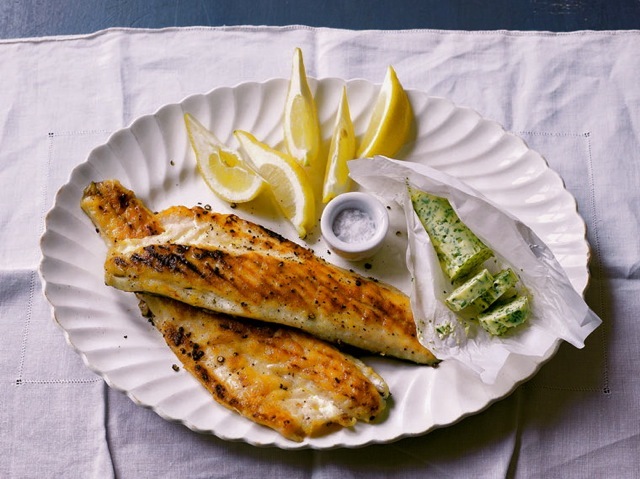 For pan-grilling you can use either olive oil or butter, but make sure the fish is completely dry before you apply it. Be sure to rinse and dry the grill pan between batches, too. First make the flavored butter of your choice. When the color of the flesh has changed halfway up the fish, use an offset spatula to flip it over and cook the other side. There will be enough butter or oil on the grill pan to cook the second side. The cooked side should be nicely colored and golden. Continue to cook until it’s just cooked through, erring if you must on the slightly undercooked side, as the fish will continue to cook a little more from the residual heat. Put on a warm plate and serve immediately with a few slices of flavored butter and a wedge of lemon. The flavored butter may be served directly on the fish, or if you have a pretty oyster shell, place it at the side of the plate as a container for the butter. Garnish with a sprig of parsley.